Modern Deep Learning in Python – RELAUNCH and VIP version! If you’ve been following my updates, you may have noticed that I’ve been hard at work doubling the size of my course, “Deep Learning part 2”, otherwise known as “Practical Deep Learning in Theano and Tensorflow”. 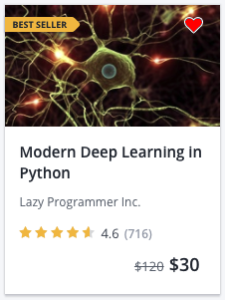 I’ve since renamed the course to “Modern Deep Learning in Python” and I am officially re-launching it today! At this point, I have completed all the major updates I’ve had in my pipeline: extending the modern regularization section, adding batch normalization, Adam, and more code for other modern libraries like Keras, PyTorch, CNTK, and MXNet. As part of this relaunch, I am releasing a VIP version of this course. Well, in addition to the HOURS of free content I’ve just added to the course, you may have heard of Tensorflow’s new Estimator API. It was released just a few months ago. You may have noticed that writing Tensorflow code can be quite repetitive. We need to define each layer, combine the layers to calculate the output, create a loss function, create an optimizer, initialize the variables, run the optimizer, plot the loss, and so on. All “boilerplate” stuff (although helpful to repeat if you are in the process of learning Tensorflow). But while the Estimator API simplifies machine learning programming, it is not necessarily easy. And hence, I’ve written a 28-page tutorial to teach you how to use it from the ground up. We start out with the Sci-Kit Learn API, and gradually build on those ideas to familiarize ourselves with the new Estimator API. We go through a FULL CODE example on a dataset NEVER-BEFORE SEEN in my courses. Some new data wrangling techniques will be taught, in particular: the “hashing trick” and how to create embeddings instead of one-hot encoding categorical variables. Now I realize that a lot of you might already be signed up for this course. That means, you get all the updated content for free and have been seeing the updates come through as I’ve added them. Woohoo! But how can you get access to the VIP material? I’ve temporarily decreased the price to $10. Courses on deeplearningcourses.com will always contain the extra VIP material. You can think of it like a small donation as a token of appreciation, but don’t forget you are still getting this 28-PAGE easy-to-follow tutorial on the Estimator API. Believe me, I’ve looked at other resources out there – they were not fun reading. So, if you are already a student of Modern Deep Learning in Python and you would like to access the VIP stuff, get it now! This price won’t last. To be sure: I still have TONS of stuff I still want to add to this course and my other courses. So much that sometimes I wonder how I’m going to get it all done! If you support this effort and you want to see MORE of it in the future, please do consider getting the VIP version of this course. I am very thankful for all the support! Note: if you order the VIP version of the course through Udemy, you should receive a link to the VIP material within 24 hours of purchase in your message inbox. So don’t forget to check your messages! Shoot me a message if you haven’t got your VIP material by that time.